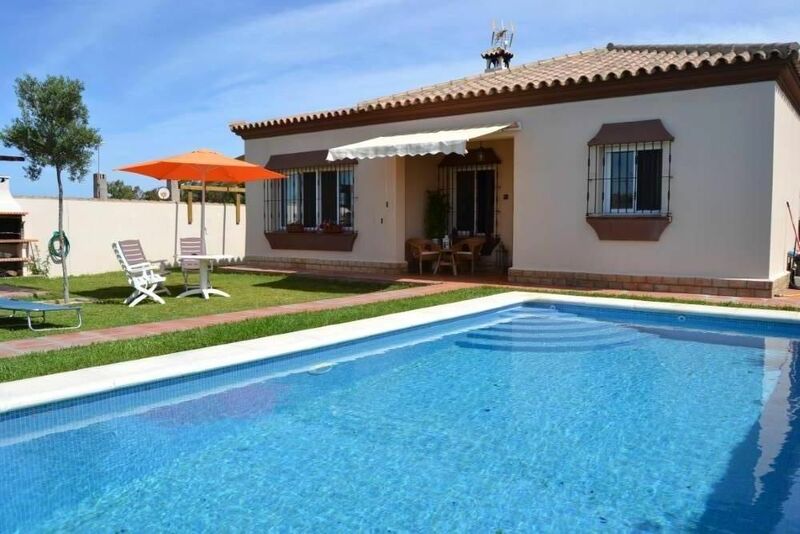 Villa / Detached villa, with double bedroom and two double bedrooms (for 6 people), fully equipped with all comforts, in a rural and quiet environment "El Pinar de los Franceses" 4 km from Chiclana. It has WIFI, large dressing room, private pool with solar shower, barbecue, wood oven, garden, ping-pong table, fireplace, air conditioning hot / cold, stereo, 42 "TV, full kitchen with washing machine. The final access to the house is a road without asphalt. Covered space for the car. Near the Eroski Shopping Center "Puerta de Chiclana". Other nearby airports: Gibraltar (100 km), Sevilla (120 km), Malaga (240 km). 25 min Cadiz - the oldest city in Europe. JEREZ - with their horses show the famous Royal School of Equestrian Art, and its Sherry wine cellars. Racetrack (Moto GP and Formula One). RATE - famous for windsurfing, kite surfing and boat trips to see whales and dolphins. From there you can take the ferry to Tangier (Morocco) in 25 minutes. EL PUERTO DE SANTA famous for its seafood and fish MARIA. DOÑANA NATURAL PARK: Major natural park in Spain. Day trips are made from Sanlucar.